Often referred to as a “Lung-in-a-Box”, the OCS Lung is a revolutionary system that preserves donor organs. *PGD3 in the first 72 hours is a severe form of acute lung injury that is a major cause of early morbidity and mortality encountered after lung transplantation. 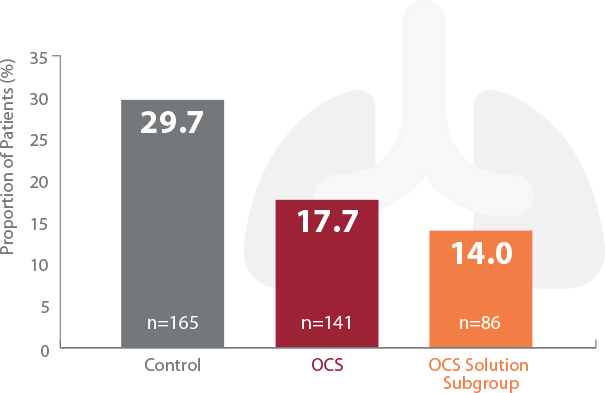 TransMedics OCS Lung significantly reduced PGD3 vs control group in the INSPIRE Trial. Time is everything. My surgery was very challenging, it lasted 11-hours. Without the OCS, I feel that I wouldn’t be here now. The OCS Lung is an FDA-approved device for utilized donor lungs and is currently under FDA review for unutilized donor lungs. The OCS Heart and OCS Liver devices are investigational devices and, are therefore, limited by federal law to investigational use in the US.